Voice phrases is a series of games for educational purposes where you as a player need to guess submitted phrases, by saying them aloud, in limited time. You can choose to play/guess idioms, common phrases, movies, music or books. 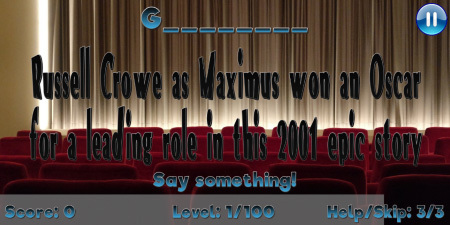 Goal is to guess as much phrases as you can in limited time offered, achiveing the best score. Games starts initially with 100 preloaded phrases (500 for Idioms) and will update regulary. Test your knowledge in this voice activated, interactive game by guessing 500 submitted idioms in unique way. Get acquainted with a selection of 500 „body parts“ idioms and see how people use body parts in everyday conversation with totally different meanings. Learn about most common phrases used in everyday conversation. See how pasionate movie fan are you and	how much do you know about movies, directors, actors, music scores, oscar winings. Play and see who took little golden statute for different achievements. Explore the best performers/musicians who were awarded with recording-academy Grammys. Upon start, depending on which game you choose to play, an indication of the phrase will be submeted and you will have to guess it simply by saying it aloud. Everything else is done by the game and implemented technologies. For idioms: Game submits an idiom with an explanation of it's meaning. Submited idioms differs depending on level you choose to play. 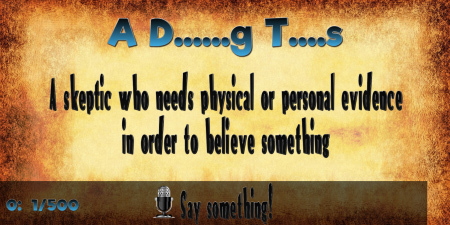 For example, if we take idiom „A doubting Thomas“ explanation on screen will show „A skeptic who needs physical or personal evidence in order to believe something“ and submited idiom would look like this on each level. EASY: (A D......g T....s) you can see number of the words in idiom, first and last letter of each word and number of the letters of each word as well. MEDIUM: (A D T) you can see number of the words in idiom and first letter of each word. HARD: (? ? ?) you can only see number of the words in idiom. 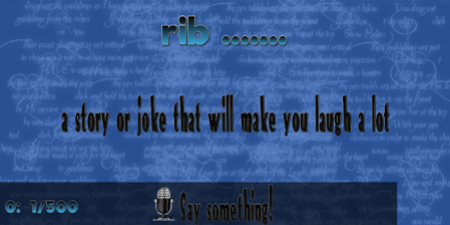 If you choose to play "body parts" idioms and for example an idiom: "rib tickler" is submitted, an explanation will show "a story or joke that will make you laugh a lot", and an idiom you need to guess will look like this on EASY level: (rib .......) where you can see a word or words of body parts completely, you can see how many words are in this idiom and you can also see how many letters (by dots) are in each word. MEDIUM and HARD levels show the "body parts" idioms the same way as you play the Idioms game. 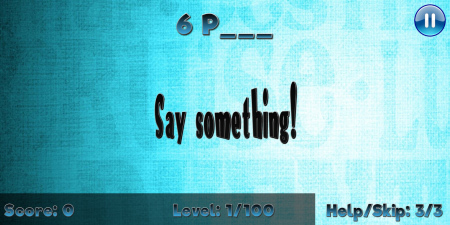 For phrases: Each phrase the game submits and expects you to guess consist of two or more words with at least one number and one word in it, starting from easier/simplier ones with two words only (one number and one word) followed (as you progress) with more complex and harder to guess phrases with 6, 7 or 8 words. Each phrase shows a number/numbers and first letter of each word in it folloved by underscores that tells you how many letters are in each word. For movies, music or books: Whether it is a movie or leading role, musical band or song, book or author, just say what you think is correct answer and see if you guessed it. Use help option to give you a hint to an answer. For example, when you start the game Voice Phrases, start screen will show up with first phrase for you to guess (as sample we will use the phrase 2 TIMES). „2 T....“ is shown in the middle of the screen and the counter at status line will start counting remaining time starting from 90 seconds down. Status line also shows your score (left), level (middle) and remaining help/skip options (right). At upper right corner you have the option to use button to pause the game and stop the counter to give you some time to think of the solution. If you recognise the phrase and you say 2 TIMES, you will see the -YES sign as a confirmation of your guess and counter will raise for 30 seconds (up to max. 90 seconds). If you miss the phrase (for example you say two types) or game recognise it wrongly, recognised phrase will be shown giving you an option to guess it again until correct one is said and recognised. In case you cannot guess the phrase and you are running out of time you have 2 options at your disposal. First one is an option to use HELP by saying it aloud and explanation or hint will be shown on screen helping you to guess the correct phrase (in this case for the "2 TIMES" phrase a help will be shown as "MORE THAN ONE TIME" or similar for other phrases). You can use HELP option max. 3 times per game. The other option for you to use is SKIP by saying it aloud and you will skip this phrase and move to next one. SKIP option is also available only 3 times per game. If your counter expires meaning you didn't finish the game, or if you guessed all phrases meaning you won and you finished the game you will see a final screen showing achieved score and your hi-score from previous playing to compare. Your best score will be saved in your local device storage and used in each new game as your hi-score that you wish to beat. In case of microphone working difficulties within voice activation commands using voice phrases games or problems in speech recognition accuracy, please refer to our „ABOUT GAMES“ section for instructions and help.